Looks like when I wrote that post on how to incorporate Resource Engagements into the portfolio analysis module of Project Online / Project Server 2016, I left out one critical step. 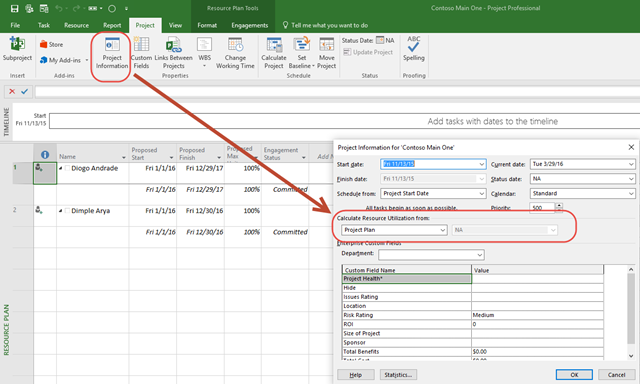 For resource engagements to show up in the calculated portfolio demand, you’ll need to open the Project Information dialog box within Microsoft Project Professional and toggle the calculation settings – then republish the project. Note that the option only appears after the project has been saved to Project Server. One of the takeaways from the recent Construction CPM Scheduling Conference in New Orleans last week (other than a couple of hurricanes on Bourbon street) was an acknowledgement that while Microsoft Project does indeed enable best practice scheduling, by default many of the required features are turned off. This causes some frustration on behalf of the scheduler who must hunt deep into the Options panel to identify and select the appropriate options for each new project. To assist in this endeavor, I wrote this little macro. It basically goes through the options and sets them to optimize the scheduling interface for detailed construction scheduling (and therefore may have to be tweaked to support project scheduling in other domains). In the past, I’ve triggered this macro whenever I run any other scripts on the schedule, i.e. I’ve written scripts to facilitate the update process….which call this routine up before going into collecting the update data. Did I forget a key setting? Let me know and I’ll update it accordingly. .MoveCompleted = True 'Move completed work prior to the status date. Toodling around in MPP 2013 today and came up with this quick code. It runs through each task and adds the ones flagged in the Flag1 field to the timeline. Note this is barely tested – and I would assume it needs to be run on a view where the timeline actually appears. Pulling the development and the project management worlds together into a single view has long been regarded as the killer feature of the Microsoft IT work management world. For evidence of this, check out this link to the 2007 Project Conference keynote where Steve Ballmer himself was on stage helping demo the new (at the time) connector with Project Server. Needless to say, Microsoft has made great strides since 2007. The version of the connector released for 2010, well, just worked. It was a bit of an effort to install (usually due to security configurations), but once you got it working, it could plug along happily. That is still the case with Project Server 2013 on-premises…..but once you start talking about the cloud based world, it becomes a bit murky. At the time of this writing, Microsoft offers Project Online, a hosted Project Server service and Visual Studio Online, a hosted Team Foundation service. This means that we regularly run into customers that have Project Server, Visual Studio, or both online. The question inevitably comes up about whether any of the online options can be integrated with each other – or with on-premises installations. Currently, the downloadable integration pack only works to link Project Server on-premises with TFS on-premises. Note this pack is downloadable from MSDN Ultimate. I’m pretty sure it’s the same pack for both Project Server 2010 and 2013, but let me know if you find out otherwise. This option is definitely the recommended option if both TFS and Project Server are on premises. This works reasonably well, although it assumes your project managers are scheduling within the Microsoft Project desktop application and not using the Web based scheduling feature. Essentially, you download the free Team Explorer add in, which then adds a tab to your Project installation. When updating tasks in Project, click the option to Publish, and the tasks appear in your TFS (online or on-premises) instance. It requires use of desktop scheduling (which – to me – is not a major issue. I live in the desktop scheduling tool). It requires a couple extra steps to push the data from the desktop to TFS – well actually, one button push. It requires an extra step to download the data from TFS into the project schedule. Also in the past, I’ve heard of issues where TFS will overwrite key data in the project schedule, like durations, etc. In testing out the Team Explorer add in, I didn’t experience these issues, but feel free to report back in the comments below. Until there is direct out of the box integration with cloud based implementations, I’d definitely recommend going this route for connecting Project Online with Visual Studio Online, Project on-premises with Visual Studio Online, and Visual Studio on-premises with Project Online. I would stress that the effort to develop your own integration package probably outweighs the incremental benefits that may be earned over using the desktop integration method. Customization scenarios typically only work when there is a significant need for automation and your processes are very well defined. Last but not least, take a look at third party tools that may be out there to assist you in the integration. More and more offerings are coming out each day, and stay tuned on the Project Server or Visual Studio application store to see if anything has popped up to support this scenario. As more and more organizations move to the cloud, it will be refreshing to see Microsoft add extensibility options to allow improved integration and customization. That’s definitely the direction I see happening with the cloud based offerings – and it will only drive the development of ever more applications that fill in the current gaps in functionality. 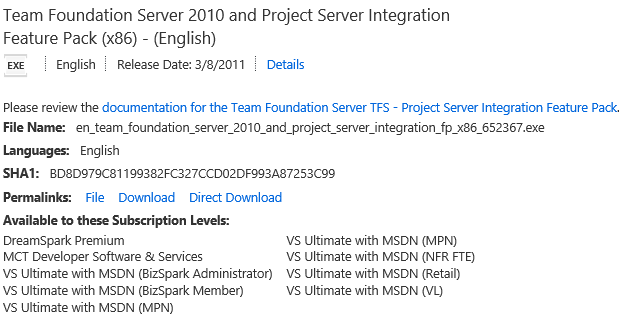 For some additional blog posts about connecting integrating Project Server and TFS…. …with additional blog posts forthcoming on Power View for SharePoint and SSIS against OData. Folks like me often get a lot of push back from project managers as we work with their PMO to ramp up the quality of their schedules. Most often, I see complaints not about the schedule itself, but about the seemingly arbitrary list of arcane rules required to ensure that the schedule prediction is underpinned by established modeling best practices. Examples of such rules might be that every task should have at least one predecessor and successor, tasks should not exceed a specific duration, or that the update methodology must be strictly adhered to. You know, simple DCMA 14 Point Assessment stuff. A schedule developed without following these rules may still be accurate, insofar as the dates may actually be realized as reported, and the data all supports the organizational reporting requirements. The model however, the underlying logic, is invisible. It’s all happening in the PM’s head and then being reported through the schedule mechanism. What we have at this point is a reporting schedule. It’s a schedule created to meet the minimal organizational requirements and to document the key dates of the project. It does not, however, capture the underpinning logic of the schedule. It is missing the schedule model. A couple of years ago, PMI introduced these two concepts, the concept of the “schedule model,” or the logical predictive model of a schedule, and the concept of the schedule itself, which is a static snapshot of the schedule model at a specific point in time. For example, I create the schedule model in my favorite scheduling application, with all of the dependencies and sparing use of constraints, etc. Then, every week, after updating my model, I generate my prediction of what the future will look like. That prediction is my schedule. The schedule is refreshed each week with the output of my updated schedule model. Are these predictions correct? I don’t know that anyone can ever say a prediction of the future is correct. The more accurate question is whether these predictions are valid. Are they an accurate reflection of everything we know about the work to date? In fact, that’s my litmus test for validity. Can I look at your schedule, and ask you, point blank, “Is this the most accurate prediction of the future based on what you know today?” If the answer is anything other than yes, I would consider the schedule to be invalid. Let’s take that and apply it to a typical audit scenario. In this scenario, you, the project manager, are telling me that the dates are all correct and valid per your latest understanding of the project. This statement is something that I cannot challenge. Well, I cannot challenge this statement – with the possible exception of calling out tasks completed in the future or incomplete work still scheduled in the past. What I can do is ask how the model was developed, to which the response is invariably, “It’s all up here.” with a finger tapping the temple. In essence, what you’re telling me is that your schedule model is all in your head. It may be valid and it may be invalid, but I, as an external observer have no way of identifying that. Your schedule model is hidden to me, and therefore, unless I trust you implicitly, I can’t trust your model. This is why we have schedule audits. This is why we have DCMA checkpoints. Because while it would be nice if we all just had a little more trust of each other, given the high cost of projects in the world today, that’s a luxury that many organizations simply cannot afford. And all of those audits and quality assurance processes come to nothing when the schedule model is hidden and we’re only allowed to see the schedule. So in the end, while you can show me a schedule that’s resource loaded and has all of the key organizational milestones attached to it, you can’t show me your schedule model. You see, it’s all in your head, it’s all mental. And that’s why I can’t make a judgment about whether or not you have a valid schedule.